← What is a Perpetual Curacy? Recently, a fellow Charlottean (a person living in Charlotte, NC) approached me with a product she distributed. This woman, Sara Thomas, recognized my love of all things Jane Austen. Ms. Thomas offered me a free canister of one of her specialty teas for an HONEST review. 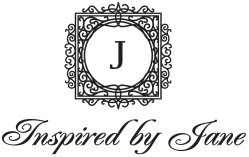 So, permit me to introduce you to the “Inspired By Jane” Tea Collection. Pemberley, a lavender and lemon green tea. Contains caffeine. 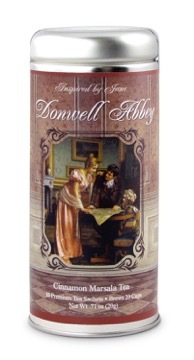 Donwell Abbey, a black tea flavored with cinnamon and marsala wine. Contains caffeine. 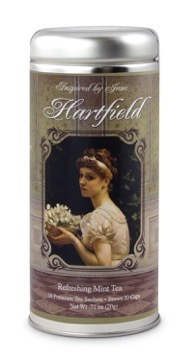 Hartfield, an antioxidant rich green tea infused with peppermint leaves and peppermint flavor. 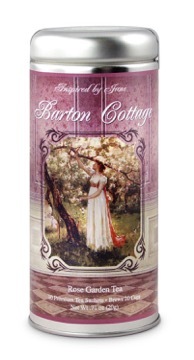 Barton Cottage, a delicate blend of Ceylon black tea, with rose petals and flavoring. Contains caffeine. 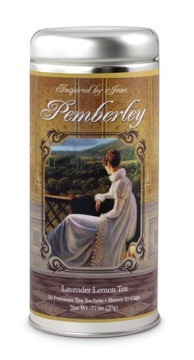 MY REVIEW: For those of you who know me well, you will easily guess that I tried the “Pemberley” brew. In reality, I chose the Pemberley tea for it has been several years since I enjoyed a good lavender tea, plus it was combined with a green tea (one of my favorites). Many times “packaged” teas combine lavender with honey, but that makes the tea too sweet for me. This tea had a light, floral flavor (sweet, even without the sugar). The lavender is the prominent flavor – not overpowered by the lemon grass. As lavender is a member of the mint family, one can taste an undertone of mint, but also an earthy, apple-like sense of flavor is quickly noted. The lavender and lemongrass combination makes a beautiful tea, complementing each others’ flavors. The tea is full and smooth at the same time. The lemongrass keeps the floral flavor from being too dominant. Both lavender and lemongrass are known for their calming effects on the digestive tract, and I found this to be true. Lemongrass is a milder flavor, which does not dominate the lavender, which I find both honey and perhaps even a chamomile combination would do. Lemon grass has a delicate lemon taste and a very aromatic floral fragrance: Smooth and fragrant with a clean finish and a slightly, spicy taste. I loved the flavor of this tea and had two full “mugs” early in the day on Saturday last. I chose the earlier part of thee day for in choosing the “Pemberley” brew, I erred. I did not read the “caffeine” part of the label, and as I do not do well with caffeine, I paid the price for this oversight. Instead of the lavender and lemon grass creating a calming effect, I knew a faster heart rate. That being said, I have purchased the caffeine free blend. Note! 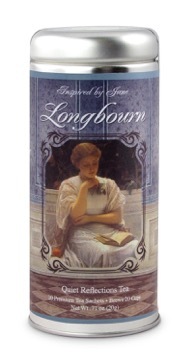 There are other Austen related items available upon the website. If you are interested, pay it a visit; yet, know this is review is not meant as an endorsement. I receive no reimbursement for this review other than a canister of the tea. This entry was posted in Jane Austen, real life tales, tea and tagged Inspired by Jane, Jane Austen, tea flavors. Bookmark the permalink. At least they are the hefty English sized bag, not the tiny ones we Yank call tea. What happened during the tea shortages or to those who could not afford tea leaves? Did they drink tea from lavender or ginger or the like? To tell the truth, I have seen Earl Grey tea with lavender in specialty shops. BTW, did you know there is only one tea plantation in the U.S.? It is in Charleston, SC, about a 2 hour drive from my home. I have visited there twice. 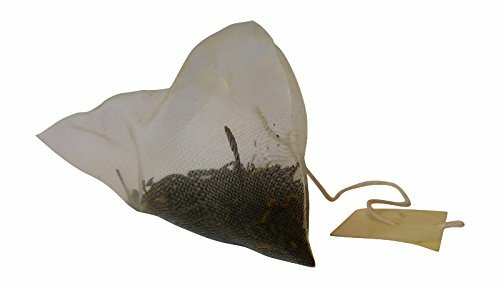 Silken sachets for your tea leaves? You’re obviously not English, American perhaps? The Founding Fathers have muc to answer for! I brew my leaves also, Brian, but I do use the bags occasionally. I saw my brewed leaves (and what is in the bag) and put the mix on my roses. It keeps the aphids away. This is the perfect gift!! They’re such pretty canisters and to know the product is more than just a pretty label – I’m shopping already! I believe you will enjoy the items, Jessica. LordBeariofBow – lol, I understand flavored teas are not for everyone! You might like the Donwell Abbey cinnamon blend. It is a black tea with a robust flavor, I call it a “gentlemen’s tea”. Hence it being named after the estate of the most perfect gentlemen in all of Jane Austen’s books! Cinnamon is good for your cholesterol, Brian. Now, play nice and give Ms. Thomas a break. She is not accustomed to your irascible nature. These sound wonderful. I’ll have to try them out. Thank you, Suzan. They are delicious. I have tried two now and will order them for friends as gifts. Thanks for the review. I may have to try some of these. I love a good cup of tea! As we share other “tastes,” I am certain you will like these, Janet.